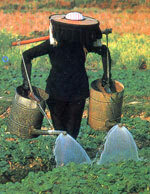 Southern Chinese peasants have a lot of ways of watering their crops, but the most common way is a pair of watering cans on a carry-pole across the shoulders. These are high-powered cans with long spouts that throw the water out either side in a drenching spray. They cover a lot of ground very quickly. Usually there's a small reservoir at the corner of the field, and the farmer simply climbs into it, cans and all, to get a refill, but a big tub will do, or a 55-gallon oildrum cut down the middle and laid on its side. "The equipment used for applying water and liquid fertilizer is of interest. Two wooden buckets are employed each about 1 1/2 feet high and 1 1/2 feet across with a capacity of forty catties each. 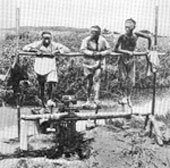 "Across the top of each bucket is a wooden handle and one man carries a pair of buckets slung on a pole across his shoulders from which the buckets are suspended by rope. He walks swiftly along the stepping stones and with his hands depresses the two buckets simultaneously, swinging them forwards and backwards, and directs the two sprays of water where required." The traditional wooden watering cans worked well, but they're heavy. As soon as the consumer age arrived local metalsmiths started making watering cans out of scrap metal cans, the ubiquitous 18-litre square-section cans that cooking oil and kerosene come in, or the larger round 25-litre oil cans. But by the 1970s this great bit of recycling was replaced by purpose-built zinc cans, usually square-section, and heavier. At first they followed the original recyclers' pattern, with the long spouts let into a corner, which was more difficult to make but it gave the best "throw". Later this was abandoned, with the spouts entering the side, much easier to make. Later still, the whole thing was abandoned -- when we started the Journey to Forever garden at the Beach House, it was no longer possible to buy a real watering can. All we could get were much smaller cans, for gardeners. We found a couple of old cans, with spouts in the sides, rusted and leaking, the handles worn away -- but they had the big roses which work so well and are now impossible to find. We repaired one of the cans but it's not very good. So we made a real one, out of an empty 18-litre oil can from the dump -- or rather two of them, one for the can, and one cut up to make the spout. It works much better -- it's lighter, and the water sprays further. See Watering can plans for details. We haven't figured out how to make new roses yet, but we're working on it. We're trying twin male/female moulds using our friend Graeme Morris's recipe for a rock-hard putty made of glass-fibre resin and lime -- that way we should be able to get the holes right. Farmer Chan's old wife, Mrs Farmer Chan, who lives on the corner, came here this morning while I was sitting on the seawall having my morning cuppa in the sun, and tried to half-hitch one of my watering cans. First she wandered round commenting on the garden and the crops and so on, said lots of nice things and gave me some good advice (which she does every now and then even when she's not after my watering can), then she siezed the can and said: "I need this." Yes, I said, so do we, but you can borrow it, as long as you bring it back this afternoon. No, she didn't want to bring it back. And so on. Her watering cans had gone rotten at the bottom of the spout and leaked, and no, you can't buy them anymore, not in Yuen Long where all the local farmers used to get their stuff, nor even in Sheung Shui, and not even in China -- only the small ones like those two over there, no use lah. Too small, and the spout's not long enough, it doesn't throw the water. She wanted the old one I'd repaired -- we didn't need it, she said, we had a new one, the one I'd made out of a cooking oil can (she knew I wouldn't give her that one!). But she accepted that we needed both cans for balance or you fall over. She much admired the new one -- strong and light, with the spout in the corner not the side, good, and it doesn't even need a wire to hold the spout up. Only the spout's two inches too long so she told me where to cut it off (she's right). I offered her the other old one, that I haven't repaired (I made the new one instead), and suggested she repair it, it's easier to fix than hers, I even told her how, but she didn't want it. 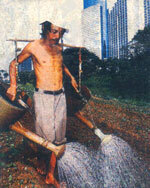 An Indonesian farmer uses oildrum watering cans at a city farm in Jakarta. Then she went home, quite happy, no problem -- it was worth a try, I guess, who can tell what a foreign devil might do. Her husband's the local healer, though he does much less of it now than 17 years ago when I first met him -- there used to be lots of damaged people there every evening when he came back from the farm. I'd twisted a knee out of joint riding a motorbike over some rocks and he put it back for me, excellent job he did -- my introduction to Chinese medicine, very impressive. Our old neighbour Chat Suk hurt his foot the other day, he was limping badly, and Farmer Chan fixed it for him -- the pain and swelling were gone the next day. I suppose he's been fixing Chat Suk for about 40 years. I guess they're pretty rich people now, like everyone else here it seems, because of the land (their sons drive HK$300,000 Toyotas), but he still takes his crops and herbs to the Cheung Chau market on the 6am ferry every morning, seven days a week. He takes two basketsful on a carrying pole -- but one of the sons drives him to the ferry pier at Chimawan these days. He used to walk past our house to the pier every day when I lived in the next valley 17 years ago, and then back again in time for lunch. "I'm getting sick of this," he told me one hot day. "I think I'll buy a car." His wife never acknowledged my existence, even after I came to live here at the Beach House. At first. She often rakes the beach for clams, so one day I gave her a really massive clam I found, and I sort of popped into existence, just like that. Now we're friends. But that doesn't mean she can steal my watering can.